Miller Manufacturing Company products are warranted to the original purchaser to be free from defects in material and workmanship under normal use and service. Miller’s obligations under this Warranty shall be limited to the repair or exchange of any part of parts which may thus prove defective under normal use and service within 30 days from the date of shipment by Miller to the original purchase, and which Miller’s examination shall disclose to its satisfaction to be thus defective. Purchaser must deliver any part or parts to: Miller Manufacturing Company, 1450 West 13th Street, Glencoe, MN 55336 for examination. This Warranty does not apply to damage caused by misuse or neglect in the field, or failure to follow installation instructions. DISCLAIMER: Due to the numerous factors relating to the hatching of eggs, Miller Manufacturing Company makes no warranty whatsoever in respect to the number of eggs that will be hatched using the Little Giant® brand incubators or egg turners. The warranty is expressly in lieu of all other warranties expressed or implied including the warranties of merchantability and fitness for us and all other obligations or liabilities on our part. We neither assume nor authorize any other person to assume for us, any other liability in connection with the sale of Miller products or any part thereof which has been subject to accident, negligence, alteration, abuse, or misuse. We make no warranty whatsoever in respect to accessories or parts not supplied by us. The above warranty applies to all Miller Manufacturing products unless otherwise specified. All products in the API line are fully warranted against defects in workmanship for a period of one year from date of purchase, unless otherwise noted. Hot-Shot® maintains a complete repair service at the factory. If a Hot-Shot® product fails due to a defect within the specified warranty period, the unit must be returned to the factory for examination. If the product is found to be defective and is within the warranty period, replacement or repairs will be made. The product will be returned postage paid. 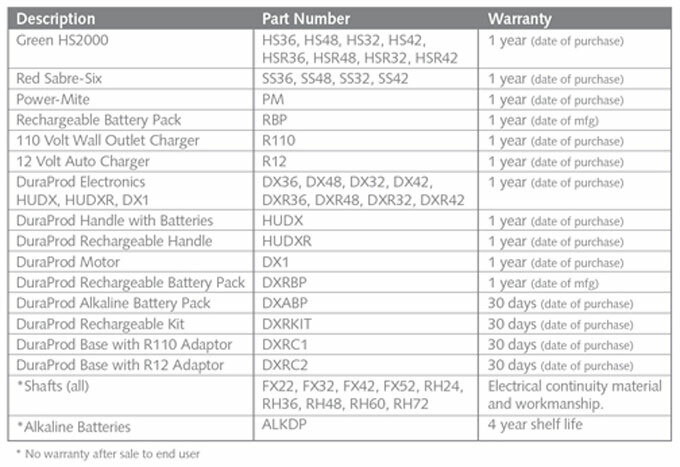 This warranty does not include case breakage or any form of physical damage, or damage due to normal wear and tear or tampering with the handle or motor unit. Hot-Shot® also maintains a repair for fee service at the factory. If a product is returned to the factory for repair and is not within the warranty period customers will be contacted regarding estimated repair costs prior to chargeable repair service being performed. 1. Enclose a note with the product that includes your full name, full address, and phone number. In addition, the provided RMA # and possible problem.